Intraosseous angiosarcomas are the rare cause for post operative bleeding. Thorough clinical examination along with appropriate investigation and repeated biopsies may be necessary for the diagnosis and further treatment. Department of Orthopaedics, Kasturba Medical College Hospital, Attavar, Manipal University, Manipal. India. 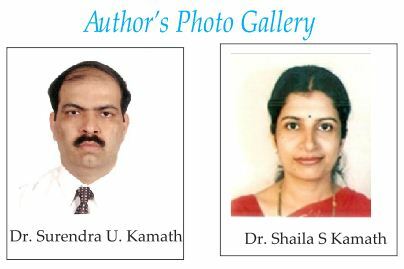 Department of Anaesthesiology, Kasturba Medical College Hospital, Attavar, Manipal University, Manipal. India. Introduction: Post-operative excessive bleeding can be due to various causes, which may be platelet deficiency, both quantitative and qualitative, vascular disorder, clotting factor defects and excessive fibrinolysis. Rarely can be due to some undiagnosed malignant tumours. Angiosarcoma of bone is an exceedingly rare primary bone malignancy. We report an interesting and rare case of an intraosseous angiosarcoma that presented as an excessive postoperative bleeding with diagnostic dilemma. Case Report: A twenty eight year old gentleman admitted to our hospital with history of continuous bleeding from surgical site over left heel since three months. About six months ago he was evaluated elsewhere for a painful progressive lesion in the left calcaneum. Following which he underwent curettage of lesion with bone grafting. One month after this he was re-operated for recurrence with curettage with bone cementing. Curetted material on both occasions was reported as aneurysmal bone cyst. One month following the second surgery, surgical scar over the outer aspect of left heel opened out and started to bleed continuously. X rays and MRI done before surgical treatment were suggestive of aneurysmal bone cyst Investigations for clotting and bleeding disorders were normal. The granulation tissue from the floor of the cavity was curetted and sent for histopathology, which was reported as angiosarcoma. Conclusion: Intraosseous angiosarcoma is a rare primary bone tumour. The diagnosis is often delayed because of the non-specific clinical presentation and radiological features. Clinicopathological correlation is very important to differentiate aneurysmal bone cyst from the aggressive type of vascular malignancies. The clinical course of disease is aggressive, as demonstrated by this current case. The initial biopsies done twice at curettage were not diagnostic and suggested the presence of a benign aneurysmal bone cyst. Due to the excessive postoperative bleeding, repeat biopsy performed which diagnosed angiosarcoma. Keywords: Post-operative bleeding, aneurysmal bone cyst, intraosseous angiosarcoma. Post-operative excessive bleeding can be due to various causes, which may be platelet deficiency, both quantitative and qualitative, vascular disorder, clotting factor defects and excessive fibrinolysis. Rarely it can be due some undiagnosed malignant tumours. Angiosarcoma of bone is an exceedingly rare primary bone malignancy that can present as an aggressive osteolytic lesion1. Histological diagnosis can be extremely challenging, as the pathological features often resemble that of aneurysmal bone cysts. We report an interesting and rare case of an intraosseous angiosarcoma that presented as an excessive postoperative bleeding with diagnostic dilemma and discuss the relevant radiological and pathologic findings. A twenty eight year old gentleman admitted to our hospital with history of continuous bleeding from surgical site over left heel since three months. About six months ago he was evaluated elsewhere for a painful progressive lesion in the left calcaneum. Following which he underwent curettage of lesion with bone grafting. One month after this he was re-operated for recurrence with curettage with bone cementing. Curetted material on both occasions was reported as aneurysmal bone cyst. One month following the second surgery, surgical scar over the outer aspect of left heel opened out and started to bleed continuously(clinical picture).X rays and MRI done before surgical treatment were mostly suggestive of aneurysmal bone cyst (X ray and MRI) Investigations for clotting and bleeding disorders including bleeding time, clotting time, prothrombin time, APTT, platelet counts, Assays of factor VIII, VW factor and factor XIII was within normal limits. He needed two units of fresh blood transfusions every alternate day to maintain his haemoglobin levels. Culture from the wound had grown pseudomonas and acenetobacter. An Angiogram of the left lower limb was performed, which showed no major feeders or abnormalities. Hence embolisation was not done. As there was no obvious cause for continuous bleeding, it was decided to re- explore the cavity in the calcaneum. On exploration of the cavity, there was infected granulation tissue with continuous ooze from the floor of the cavity. Curetted tissue was sent for histopathology, which was reported as angiosarcoma. Further immunohistochemistry in the form of CD34, CD31 and CK confirmed the diagnosis of angiosarcoma (Histology). Staging investigation revealed a small nodule in the right upper lobe of lung. Patient underwent a below knee amputation and the stump healed primarily. Also he was given 6 cycles of postoperative chemotherapy. There are various causes of excessive postoperative bleeding. These include platelet deficiency, both quantitative and qualitative, vascular disorder, clotting actor defects and excessive fibrinolysis. Angiosarcomas are aggressive, malignant vascular tumours derived from mesenchymal cells and can occur in any organ of the body. However the development of intraosseaous angiosarcomas are exceedingly uncommon and account for less than 1% of all angiosarcomas . Histologically the features of angiosarcoma of bone can often resemble aneurismal bone cyst and therefore diagnosis can be extremely challenging [1,2]. Angiosarcomas can present with evidence of hemorrhage or coagulopathy due to their intrinsic characteristics of malignant vascular proliferation. Differentiation with Clinicopathological correlation is very important when making a diagnosis and devising subsequent treatment. From data from the Surveillance, Epidemiology and End Results study, only 36 (1.4%) of 2,627 primary bone sarcomas were classified as angiosarcomas. The clinical course of disease is aggressive, as demonstrated by this current case study. The initial biopsies done twice at curettage was not diagnostic and suggested the presence of a benign aneurysmal bone cyst. Due to the unusual excessive postoperative bleeding, repeat biopsy was performed and the diagnosis of angiosarcoma of the bone was made. From imaging, it was suggested mostly isolated calcaneal disease with a doubtful seeding in the upper lobe of right lung. As seen in this case, the histologic features of aneurysmal bone cyst can mimic that of angiosarcoma. On histopathology, aneurysmal bone cysts are blood-filled cystic cavities that are lined by a thick, fleshy membrane that has an endothelial-like inner layer. Nearly 50% occur as a secondary lesion in another tumor. These lesions include giant cell tumor, chondroblastoma, osteoblastoma and some malignant tumors . Often, the secondary lesions may be actually larger than the associated primary tumor. Majority aneurysmal bone cysts have good responses to primary treatment. In our case, the patient had postoperative bleeding following the initial curettage of tumor and bone cementing. Bleeding continued after second curettage with removal of bone cement. Furthermore, the clinical course deteriorated progressively which is not compatible to the disease progression of aneurysmal bone cysts. The diagnosis of angiosarcoma can be confirmed by immunohistochemical staining for endothelial cell markers such anti- CD31 and 34 [4, 5, 6]. 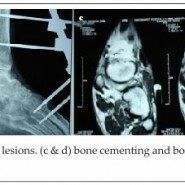 Intraosseous angiosarcoma is a rare primary bone tumour. 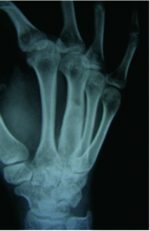 The diagnosis is often delayed because of the non-specific clinical presentation and radiological features. Clinicopathological correlation is very important to differentiate aneurysmal bone cyst from the aggressive type of vascular malignancies. Timely surgery is potentially curative although prognosis of most of the cases is often dismal . 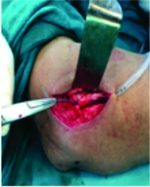 Diagnosing the cause for excessive post operative bleeding from a bony lesion can be very challenging. Intraosseous angiosarcomas are the rarest cause for this condition. Thorough clinical examination along with appropriate investigation is essential for the diagnosis and further treatment. 1. Campanacci M, Bertoni F, Bacchini P. Aneurysmal bone cyst. In: Campanacci M, Bertoni F, Bacchini P, editor. Bone and soft tissue tumors. Vienna: Springer-Verlag; 1990. pp. 725–751. 2. Dorfman HD, Czerniak B. Bone cancers. Cancer. 1995;75:203–210. 3. Tse LF,Ek E TH, Slavio JL et al Intraosseous angiosarcoma with secondary aneurysmal bone cyst presenting as an elusive diagnostic challenge. Int Semin Surg Oncol 2008: 5:10. 4. Budd GT, Management of Angiosarcoma Curr Oncol Rep 2002: 4: 515-519. 5. Balicki D , Buhramann R, Maclean J et al Multicentric epitheloid angiosarcoma of the bone, Blood Cells, Molecules and diseases 1996: 22 (17):205-213. 6. Evans HL, Raymond AK, Ayala AG, Vascular Tumours of the Bone, Human Pathol 2003: 34(7): 680-689.